All cytokines and growth factors listed below are produced in-house, ensuring the highest standards of quality and consistency. Most products are free of tags or additional amino acids, and many are produced in mammalian cells to maximize natural conformation and glycosylation – especially important for successful in vivo applications. Validation includes the use of CST antibodies to assess downstream signaling events. 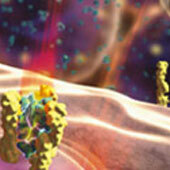 3D animated video tutorial illustrating IL-6 eceptor complex formation and activation. Jak and cytokine receptor mutations found in various cancers, along with the corresponding PubMed reference(s). The Jak/Stat Utilization Table displays the combinatorial use of tyrosine kinases and Stat proteins in cytokine/growth factor signaling. Overview of Angiogenesis antibodies & related reagents, interactive pathway diagrams, and other technical resources. CST Immunology Signaling Pathways poster includes Jak/Stat, NF-KB, Toll-like Receptor, B Cell Receptor, and T Cell Receptor signaling pathways. Several types of ELISAs have been developed: direct ELISA, indirect ELISA, sandwich ELISA, competitive ELISA, multiplex ELISA. The types of ELISAs are categorized based on the type of antibodies and enzymes used to bind the antigen of interest. Metabolism defines all of the chemical changes or processes within cells, tissues, and organisms that sustain cellular homeostasis. A scientific resource for the TIR protein domain containing information on structure, function, and binding in TLR Signaling. iPRM is a multiplexed LC/MS assay service that combines the specificity of mass spectrometry, the throughput of an immunoassay, and the power of multiplexing to accelerate the time-to-market of your drug and/or diagnostic test. Neurodegeneration refers to disorders of the CNS that lead to loss of neurons or glia, and is associated with age-related diseases, autoimmune attacks on the nervous system, or genetic mutations that affect the heath of CNS cells. The Ubiquitin Ligase Table provides a comprehensive list of E3 ubiquitin ligases along with their substrates and corresponding PubMed reference(s). Cellular senescence is stable cell cycle arrest linked to aging and cancer and other disease states, including those associated with inflammation. It is induced by DNA damage, oncogenic signaling, and telomere shortening. Cell viability is a measure of the proportion of live, healthy cells within a population. Assays to assess cell viability measure metabolic activity, ATP content, cell proliferation, or membrane integrity. Kinase-disease associations table showing kinases, kinase groups, disease types, and the molecular biology basis for disease. Overview of PI3K/Akt signaling pathways, antibodies and related reagents, interactive pathway diagrams, and other technical resources. A table that lists shelf-life expectations for CST products (when stored under the recommended conditions). Overview of MAP Kinase signaling pathways, antibodies and related reagents, interactive pathway diagrams, and other technical resources. Expert-reviewed interactive pathways providing current overviews of NF-kB and Toll-like Receptor (TLR) signaling, as well as links to products from Cell Signaling Technology. Expert-reviewed interactive pathway providing a current overview of Nuclear Receptor Signaling, a pathway description, select PubMed references, and links to PhosphoSitePlus. Video tutorials illustrate the science behind cellular processes and signaling pathways. Alphabetical listing of protein, pathway, and antibody acronyms, curated by Cell Signaling Technology.